I actually did not go that long..although it always seems to feel like that in Vegas. I don't know how many of these I have been to now but it seems like such an important part of my year that I would be somewhat lost without it. I love the live broadcasting we get to do from the show floor. 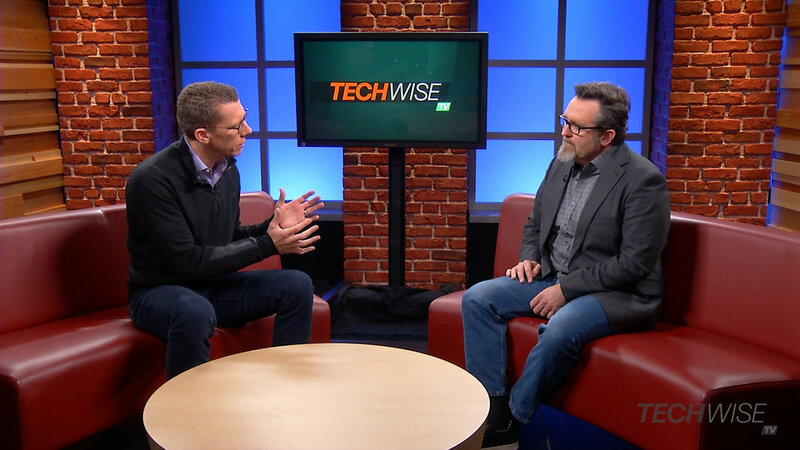 I miss doing many of the deep-dives we used to do as part of TechWiseTV but now I feel like I am much more a part of the event. It's a reunion of sorts as well as this is one of the few times I get to meet so many great geeks. As I had hoped, Bryan turned out to be an extremely down to earth guy...or in fairness perhaps...his role that day as a famous actor acting like a down to earth guy on a corporate gig...was spot on. Either way, you can tell that he cares very much about his craft and appreciates the gifts he has been given. It felt like he was working hard to make me comfortable in my role....which I appreciate...and then worry that I was giving off a 'I need help vibe.' Either way....I remain a big fan. I did not finish his book until a few days after this interview...but I recommend it. He has a great writing voice and shares some great stories from his humble beginnings. The crew was largely the same this year...and we always feel like we fought a war by the time we finish. The breakneck pace of doing a non-stop stream on facebook, youtube and cisco.com among a few others really kept us busy. The Cisco Live team is always pushing for more and better...which I love...and this was a nice staging area not too far from the broadcast studio. The ideas was that executives and such would be giving TedTalk style pitches that were limited to 30 minutes. These would start at the top of each hour. The cool thing about this is that we would be doing live shows/updates between these times so we were handing off to that room from the live broadcast, (continuous show to the audience of course). The challenge was that most presenters were ending their talk much earlier than 30 minutes...and we had to fill time almost every hour...which really added up. I think the fatal error was that the room they were in felt very disconnected from the broadcast...there was nothing in there that indicated they were live with our thousands of viewers and so to them...their audience was small and maybe not that energetic...they would just end...no concept of the fact that the story was continuing. It would have helped a lot if the live broadcast was playing in that room at a minimum...then they could see our set up and hand-off...plus their room would not be so quiet and boring between presenters. As one example of trying to fill time...I was sitting in the back of our broadcast area and did get about 10 minutes notice...the issue was that James Bedford was on stage and they were still waiting for his guest to show up. We needed to fill time and do it away from the stage so the crew could get the new guests mic'd up and ready to go. Now you know what was happening...here is what it looked like as I made stuff up. This little video helps me keep from feeling too beat down driving the kids to school often multiple times a day...seems quite easy like this. It just always seemed like there would be more time in the middle here...a restful gap of some sort between these two bookends of like responsibility. It's reality I suppose. I know there are others who grow this...I am not unique and not asking for special favors. Top marketing veteran Ann Handley gives expert guidance and insight into the process and strategy of content creation, production and publishing, with actionable how-to advice designed to get results. Traditional marketing techniques are no longer enough. "Everybody Writes" is a field guide for those who know that great content is the key to thriving in this digital world. I love self-deprecating humor. This has me and my colleagues square in its cross hairs...plus, I love Crosby, Stills, Nash and Young...well, that sound they had anyway..